The characters, and actors who play them, in The Young and the Restless, right to left Ester (Kate Linder), Raul (David Lago), Michael (Christian LeBlanc), Ravi (Abhi Sinha), Jill (Jess Walton), Dina (Marla Adams), Paul (Doug Davidson). 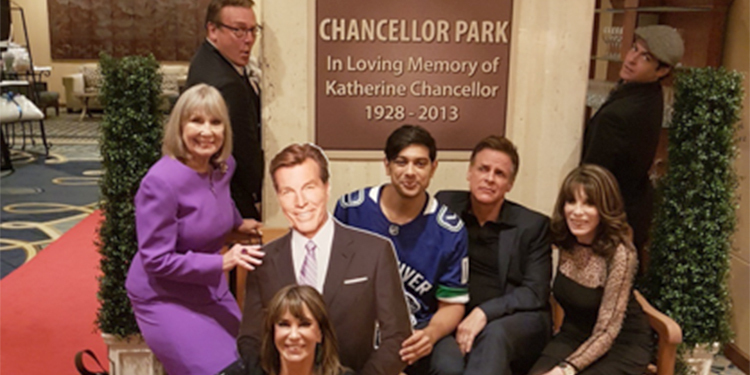 When asked why she was at the Four Seasons Hotel for the afternoon tea with the cast of The Young and the Restless, Brenda Smith said, I’ve been a big fan for 20 years.” That and the fact that it was for charity, to raise funds for the Canucks for Kids Fund, were her main reason for coming. Smith, who works in Richmond, got to meet and greet seven of her favourite actors from the afternoon soap opera the gala event Sunday, July 15. A multitude of selfies were shot with Kate Linder, one of the organizers of the event and the actor who plays Esther in the daily show, as well as with the other personalities who mingled with those at the private reception that proceeded the high tea’s panel where the cast answered questions and kibitzed with MCs, Christian Le Blanc who plays Michael and local journalist and television host, Jim Gordon. The fans ranged in age from elementary students to 99-year-old Isabel Jean Smith from Coquitlam, who brought her daughter with her. The backgrounds of the attendees were equally diverse. Examples included a Vancouver-educated woman just back from a stint in Bethlehem as a conflict resolution specialist with women in Palestine and Israel, a house cleaner, and a retired 90 year-old dentist. The diversity continued with the cultural background with longitime fans from the Huuayaht First Nation near Bamfield making the journey from the island to retired computer programmers who drove up from Seattle for this event that marked 45 years to the day that The Young and the Restless began. All cast members donate their time for the event. The Young and the Restless is a daily show that routinely does 82 pages of script every shooting day. Other popular weekly shows tend to shoot less than five per day. They are busy people who work hard, long days and evenings used to memorise their lines. Soap operas are often seen as vacuous entertainment but they can also be a powerful social force. The Young and the Restless also chooses to use their drama for education. This year, woven into the show is the reality of dementia. 80-year-old Marla Adams’ character, Dina Mergeron, illuminates the issues living with Alzheimers. The Sunday, July 15 event raised tens of thousands of dollars for the Canucks for Kids Fund.